To celebrate the 50th anniversary of their Greening Singapore project this year, the National Parks Board has come up with a whole string of initiatives that include tree-planting and photo competitions for the coming months. 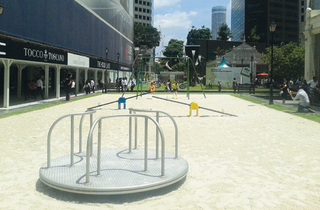 Among the highlights is the ‘Playsets of Yesteryears’ installation, currently at Raffles Place Park. 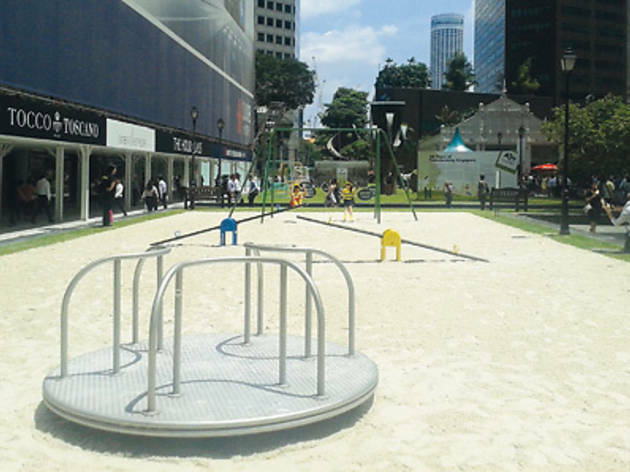 Set up amidst the steel and glass skyscrapers of the CBD, it features a collection of play equipment from the 1970s and ’80s, including old school swings, merry-go-rounds and seesaws, which were brought over from various playgrounds around town such as Fort Canning Park and Mount Emily Park. They’re proving to be a hit with the young and old alike – don’t miss the collection of smaller games available for use (just remember to return them), and check out the photos that show how the area has changed over the years as well. The installation is at Raffles Place Park until 19 May, and then East Coast Park (Jun-Jul), Bishan-Ang Mo Kio Park (Aug-Oct) and Botanic Gardens (Nov-Dec).